The ice cream of the future is struggling to survive. After a four-year battle with its biggest lender, Dippin’ Dots Inc. filed for Chapter 11 bankruptcy protection on Thursday in U.S. Bankruptcy Court in Paducah, Ky., to avoid foreclosure. 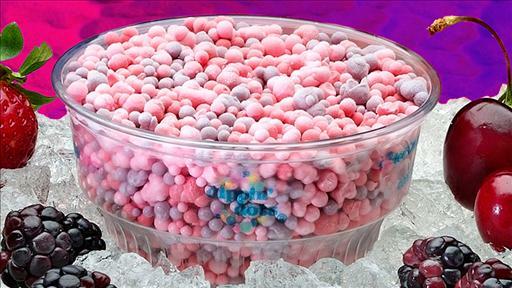 Dippin’ Dots, the self-described “ice cream of the future,” filed for Chapter 11 bankruptcy protection. Katy Stech has details on The News Hub. The manufacturer of the quirky and colorful ice cream beads, which are flash frozen using liquid nitrogen, owes $12 million, the bulk of it to a unit of Regions Financial Corp., which moved to foreclose on the loan this week. The 170-worker company, which calls its frozen treat “ice cream of the future,” fell into technical default four years ago at the peak of the economic crisis, when customers were no longer willing to spend the few dollars it cost for a cup. It has about 140 Dippin’ Dots retail locations, which are mostly controlled by franchisees, and agreements with 9,952 small vendors who sell the ice cream at fairs, festivals and sports games. It isn’t sold in grocery stores because of its extreme cooling requirements. Its sales woes came at the tail end of an expensive legal battle—one that the company ultimately lost—over whether founder Curt Jones properly filed the patents that protected its special freezing process. 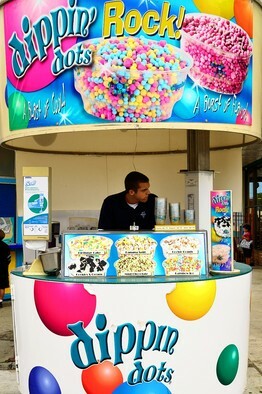 Alamy A patent fight preceded a sales drop for ice cream vendor Dippin’ Dots. “All of that hit us at the same time,” said Steve Heisner, the company’s director of administration, customer service and information systems. Mr. Heisner said that Dippin’ Dots offered Regions several proposals to pay a portion of its loan, but the bank rejected the offers before posting a foreclosure notice on Tuesday. A representative for Regions Bank declined to comment. The company said its assets are valued at $20.2 million. It owns a 120,000-square-foot plant in Kentucky that can produce more than 25,000 gallons of frozen dots a day. Mr. Heisner said the company doesn’t expect to sell its operations, which are still mostly owned by Mr. Jones, a microbiologist who started the company in 1988. The company has been hailed as an achievement in entrepreneurship by celebrities such as Oprah Winfrey. The company said it sales are slowly recovering. As of Thursday, it reported having $27.7 million in revenue, above last year’s $26.7 million. Company executives sought court permission to spend some of the cash collateral that secures the Regions Bank loan to enable it to continue operations. The court set a Nov. 17 hearing on its request. “Without use of the cash collateral…[the company] will not be able to pay its vendors, and its vendors will likely cease to provide goods and services to the debtor on credit,” the company’s attorneys explained in court documents. According to the company’s proposed spending budget, it will need at least $23,000 to pay for liquid nitrogen alone through the end of the year. The liquid nitrogen is used to keep the ice cream dots below the necessary temperature of minus 40 degrees Fahrenheit. ← What is Twitter All About ?